Duo Band Live Music Entertainment Available for all Functions and Events – Weddings, Corporate Functions, Events, Parties, Birthdays, Christmas Parties, Awards, Product Launches & more! Duo Band is 100% Live Band – No backing tracks! No sequencers! Check us out & get a booking today. Friendly and Professional, we offer you a ‘Stress Free’ ease of booking our band. Taking Bookings For 2019 Now!! Duo Band A favorite and popular Duo based in Auckland, offering quality sound, musicianship and vocals second to none. Duo Band are like a 4 piece live band in a Duo package. All 100% Live, No Backing tracks or samplers – We consist of Bass guitar, Acoustic guitar, two vocals, Foot Drums and Brass. Its true what they say! Good things come in small packages! 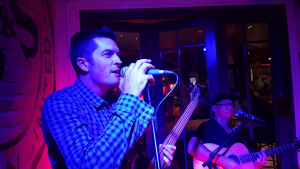 Duo Band are professional and versatile – both have been members of the covers band ‘Contagious’ for well over 10 years so have a considerable song list to draw on. Our primary aim is to entertain the crowd with songs that they want to hear. Both sing lead and backing vocals so you get a rich sound as well as a variety of styles. 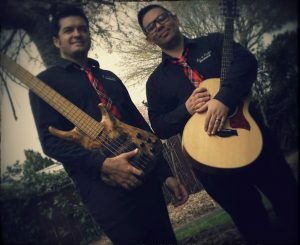 For a fun, entertaining and professional act, Tee and Carlos Duo Band are the perfect duo for your event. Quick setup times 20mins from load in to stage etc.